From the left,A. K. M. Abdullah, Financial Sector Specialist South Asia Finance and Private Sector of World Bank,Mr. Syed Afsor H. Uddin, CEO, PPP Office; Mr. Md. Abul Quasem, Deputy Governor and Project Director, Bangladesh Bank, Shikha HusneAra,Joint Director & Deputy Project Director of IPFF andpersonnels from PFF are seen in the meeting. Mr. Syed Afsor H. Uddin, the Chief Executive Officer of PPP Office attended a view exchange meeting on October 02, 2012 organized by Investment Promotion and Financing Facility (IPFF) cell of Bangladesh Bank regarding support from IPFF for financing potential PPP projects. 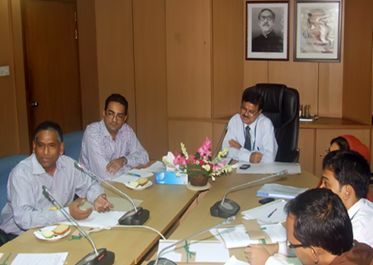 The meeting was chaired by Mr. Md. Abul Quasem, Deputy Governor, Bangladesh Bank & Project Director, IPFF Project. Mr. A.K.M. Abdullah, Financial Sector Specialist of the World Bank, representatives from PFIs and officials from the IPFF project cell were also present in the meeting. Various important issues including infrastructure bond market development, procurement system of GoB and the World Bank and the pipeline of potential PPP Projects were discussed in the meeting. Mr. Afsor H. Uddin mentioned that PPP Office has been established to act as the central point for promoting and facilitating PPP projects and is actively working with the development partners in the country including the World Bank and ADB to develop the PPP Program in Bangladesh. The IPFF representatives informed that they are pursuing several potential PPP projects for IPFF financing. On that note the CEO of PPP Office mentioned that a number of projects were currently being processed under the PPP policy and he expressed optimistically that a few number of projects would be launched for procurement in the new term.